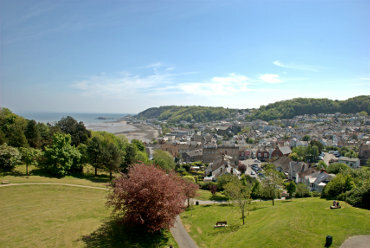 This view from the castle grounds shows most of Oystermouth/Mumbles. As far as the local council is concerned it is Oystermouth but if you ask people here where they live then most of them will tell you 'Mumbles'. So take your pick. Either way it is an attractive village with a 12th century church. 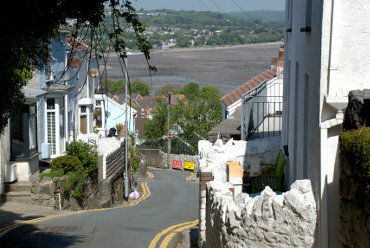 Oystermouth was enlarged significantly during Victorian times and there are some rather steep narrow back roads with some nice views over Swansea Bay. 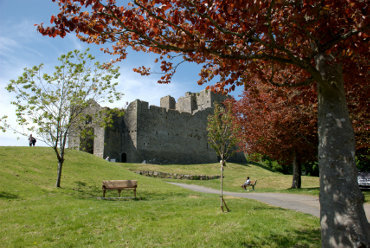 13th century Oystermouth Castle perched on a hill high above the village. Owned by the Lords of Gower the castle declined in importance in the 14th century as the family was then living elsewhere and after the Middle Ages the castle gradually fell into ruin. There is plenty of sandy beach along by the road to Mumbles Head and this part of the coast is the southen side of Swansea Bay. 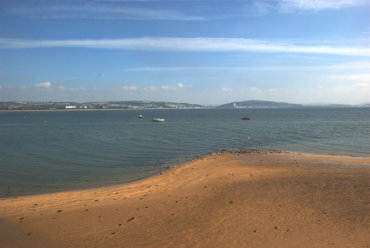 In the right half of the picture the tall white building on the far side of the bay marks the position of Swansea. 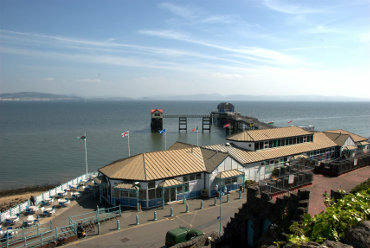 Mumbles Pier opened in 1898, is 835 feet long and when we were there it was obviously undergoing refurbishment. It was the western terminus of the world's first passenger carrying railway which started at Swansea and initially was horse-drawn chaging later to being hauled by steam locomotives and finally converted to a tramway. The railway finally closed in January 1960. 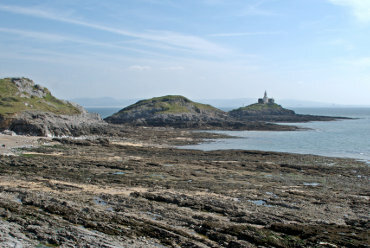 Mumbles Head showing the lighthouse built in 1790. The high ground on the horizon is the other side of Swansea Bay. The two obvious lumps are islands at high tide but at low tide it is possible to walk between them.